The best of both world - veg and non-veg - come together to create this awesome dish. 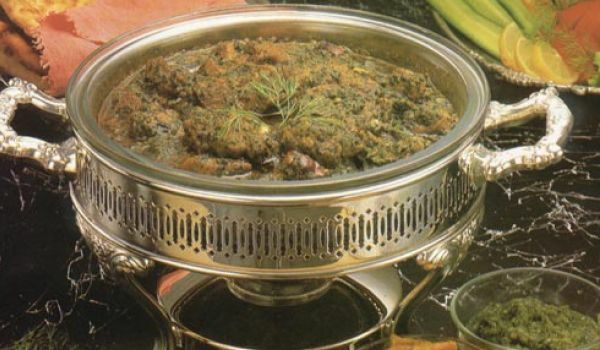 Spinach and mutton blend into making saag meat and with minimal spices this food item retains the healthy quotient. If you have not tried this yet, you need to do it ASAP and surprise your family with this too. Boil spinach leaves and grind to make fine paste. Fry onion paste in oil till they become golden brown. Add garlic and ginger paste and again fry for about 2 to 3 minutes. Add mutton, khus khus, chilli powder and salt. Seethe on a medium flame until meat turns brown. Now add cumin powder, coriander powder, tomato powder and the ground spinach. Cover and simmer. Keep stirring occasionally till mutton is well done. Sprinkle it with garam masala.